Through the twists and turns that has become the norm in King David’s household we see God painfully faithful to his word. His judgment remains on David’s house as Absalom rebels and David flees. Yet it is God who remains on the throne, and preserves David’s place on it, frustrating the usurpers, protecting his king and removing those who defy him. In the ups and downs that we know in life, who calls the shots? How do you benefit by trusting God in the good and the bad? How’s your prayer life? Perhaps you pray “plastic surgery” prayers – that look and sound OK but cover up how you are really feeling. In Psalm 22, Simon Marshman takes us to a ‘raw and real’ prayer of King David, to help us learn to rely upon our faithful God even though we may be struggling through difficult times. Ken Noakes preaching at Trinity Hills, talks of Paul’s faithfulness and confidence in God, and that despite suffering and “the storms of life”, that God will comfort us and that his kingdom will prevail. Is it true that ‘God will never give you more than you can handle’? Did Jesus say so? 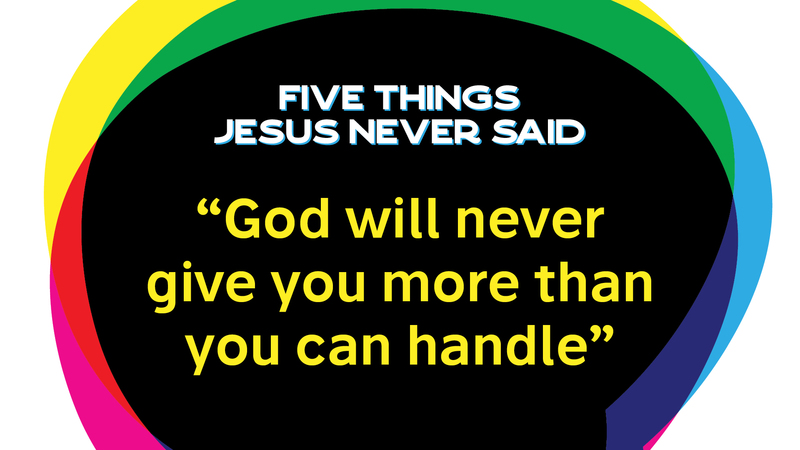 The fourth topic in our ‘Five Things Jesus Never Said’ series! Living now in the face of Suffering. How does a Christian become more resilient in suffering? 3. Proclaim Jesus – know what you believe so that when put on the spot you are able to stand firm for Jesus (c.f. Eph 6:14-17, 19-20). One of the best ways to defend yourself, is to continue to proclaim Christ (John 15:27). 4. Love those who make you suffer – Jesus in the Sermon of the Mount taught his disciples to ‘Love your enemies and pray for those who persecute you’ (Matt 5:44 c.f. Romans 12:14, 17-21). There is a humility that demonstrates a Christlike attitude which is on display whenever a Christian suffers. 5. Recharge – You have been given a Christian family who can be a wonderful support. Under God, use them to help you recharge and then return to continue standing firm for Jesus (Heb 10:24-25). Christian suffering when put into a Christ-shaped perspective calls for a resilience that trusts that God will one day put all things right. Christians should live out the good will of God not just at times of comfort and convenience but also in the times of challenge, conflict or persecution. If you are going to live for Christ, are you willing to make a stand? Living for Christ will involve Suffering! I wonder, what the original readers of 1 Peter might have been thinking as they contemplated all the different kinds of suffering that might lie before them. Like us, I am sure they would have been uncertain. Peter, seems to have understood that uncertainty and offers some perspective by looking at the role judgement plays in suffering. It is a reality that Christians will suffer for their faith – what strategies could Christians employ to help them persevere resiliently in the face of suffering? Here is a truth that is hard to swallow: Living for Christ will involve suffering! Peter puts this truth into perspective in his first letter. First he spoke of a a Christ-centred hope (1:3-2:10), then he taught his readers how to live with a Christ-centred hope (2:11-4:11). In the final section of his letter, Peter wants to ensure that his readers understand what it means to suffer under a Christ-centred hope (4:12-5:11).